I've been in my Tallahassee corporate apartment for a few months now, enjoying the space and familiarity after years of the Hampton Inn and Courtyard hotel. More than anything else though, I love my kitchen. It's nothing special - standard issue new apartment appliances, cabinets and counters - but it's solid, well laid out, and it makes me happy. This week, I finally made it back from work early enough to make a loaf of bread. It wasn't perfect, but the act of engaging the dough, the 10 minutes of kneading (tiring! ), the quiet that comes from waiting for dough to rise, and the smell rising from the loaf while it baked were enough to tide me over happily into my long, drawn out week. Making bread, especially here without the stand mixer or cooling rack or any of the other special gadgets I've got at home, connects me to something really elemental about eating. It's alchemy, the transformation of a few ingredients - this bread was just flour, yeast, water, and salt - into something completely unrelated to any of its parts. So Monday was construction day. 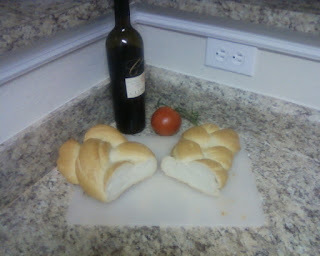 While the bread baked I made a simple dinner and was happy to slow down. 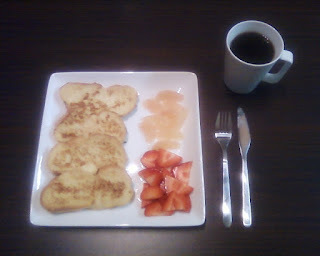 Tuesday morning, it was on to bread deconstruction number one: French Toast. It was a simple deal - eggs, milk, vanilla, and a little sugar with the first slices of my bread and a few strawberries and grapefruit sections along the side. (Grapefruit life hack here - cut your citrus this way, and it'll change your life). 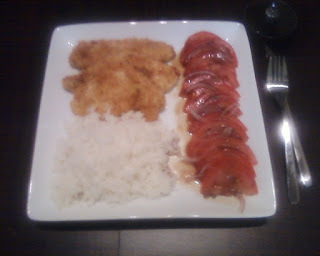 A couple of forgettable but decent meals got me through to Wednesday night, and Deconstruction Number Two: Fried Chicken. What a blast. I took a couple of thick slices of the bread, cut them into chunks and had at them with the blender at a relatively low speed. Bread chunks in; bread crumbs out. I cut my remaining chicken breast from Tuesday night into 4 thin, flat slices, and melted an obscene amount of butter in my frying pan. I also added some dried oregano, basil, salt and pepper to the bread crumbs, started up the rice, and got my assembly line set up. Four slices of chicken, first into flour, then into egg, then into a gallon ziplock bag with the spices and breadcrumbs. Gave it a few good shakes, and then into the buttery pan. While the chicken cooked - which didn't take long on account of the thinness - I cut up the one tomato I had left into thin slices and layered them with red onion slivers and a quick little balsamic vinaigrette. I'm not saying this was earth shatteringly good food. But it was Good, and it had the meaning that things get when you cobble them together with your own clumsy hands. Life is better with kitchen. new camera should arrive next week - no more fuzzy cell phone shots!